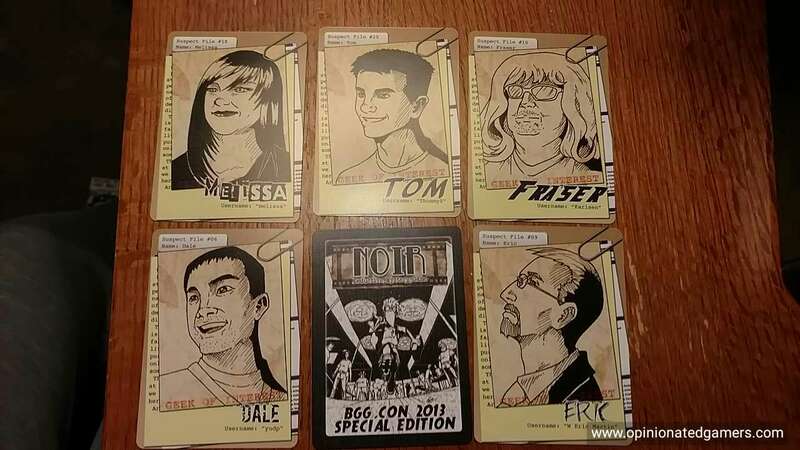 Designer: D. Brad Talton, Jr.
Millennium Blades is subtitled as a “CCG Simulator Card Game”. In this game, players take on the role of world famous CCG tournament players. They are all competing to be the world champion at Millennium Blades, this particular world’s most popular collectible card game. According to the designer, this game was designed to re-create the “excitement, desperation, discovery, hope, dread, and camaraderie” of playing an immersive CCG. The boardgame of Millennium Blades is played over three rounds. Each round is broken up into a twenty minute real-time deckbuilding phase and then followed up by a tournament phase where player pit their created decks against each other. As you would expect from a CCG-simulator, there are a bunch of cards in the box – there are more than 500 different cards in the box – split up into a core set and many different expansion sets. Each player will start with a starter deck comprised of 9 cards. 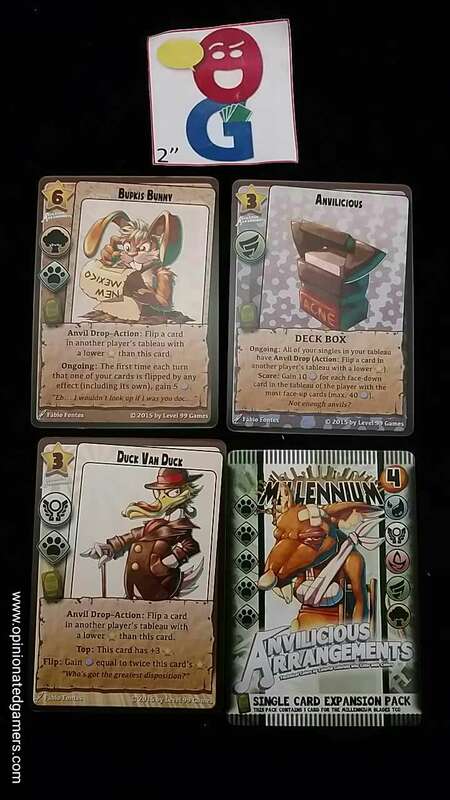 The cards available in any given game allow for supreme variety. The core set of cards is always included in the deck. Then, players must choose 5 of 11 expansions, 4 of 9 premium sets, 3 of 8 master sets – these 12 sets are all shuffled together with the core set to form the Store. You also choose 5 of 10 promo sets that are used in other parts of the game. Each of these sets varies from 6 to 12 cards, but the permutations are nearly endless. Needless to say, the total card set will be different each and every time that you play. Each of the cards has a common format (As you would expect from a CCG). In the upper left is the star value – which can vary from 1 to 10. Under this is the set icon – this tells you which expansion set the card comes from. Next is the Element – each card belongs to one of six different elements and then the Type – again, there are six different Types which the cards are split up in to. Finally, the last icon on the left tells you the general rarity of the card (i.e. is it a core card, expansion, master card, promo, etc). Then, the rest of the card is typical of CCG formats with title at the top, big piece of art which is pretty to look at and then a printed action on the bottom portion of the card and usually some italicized flavor text which also has no effect on the game but is generally amusing to read as you think about how much time someone spent trying to create the specific mythology of that game/expansion. The back of each of the singles also follows a similar format – with the exception of the core cards. The core cards simply say Millennium Blades on them and have no other icons. All of the other expansion cards have two sets of icons – a left column telling you the general distribution of the Types in that expansion and the right column telling you the general distribution of the Elements in that expansion. Each player gets a two-sided player board – one side used in the deckbuilding phase and one in the tournament phase. There are also two large gameboards placed in the center of the table. One is for the store – the huge deck of 276 cards is shuffled and placed at the top of this board. Then nine cards are dealt face down to the nine spaces of the store. The card backs are all different, reflecting the different expansion sets in the game. The card shown on the other side represents the one rare or desirable card that you would have picked of the booster pack if this were a real CCG. 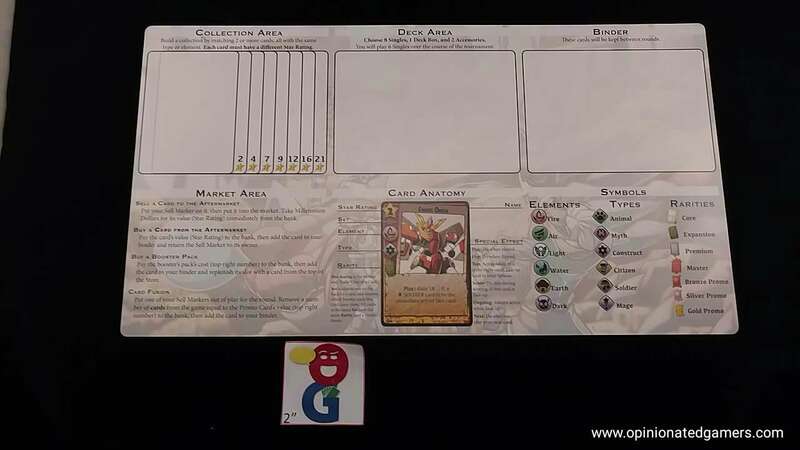 The bottom of the store board is the area for card fusion – there are three different booster decks which are placed here for this purpose. The other board has twelve spaces on it which represents the aftermarket. This will be used in different ways in each of the two phases. There are also spaces here for the two meta-decks, each only 6 cards. Each player chooses one of the six characters in the game and chooses/is given a starter deck. Be sure to read both sides of your player cards as each character comes with a unique ability to be used in each of the two main phases. Each player also takes a set of Sell Tokens as well as a set of Friendship cards – and now, after about fifteen minutes of setup – you’re ready to start! Again, remember, that you will be playing three rounds in the game, and the goal is to have the most Victory Points at the end of the game. Deckbuilding phase – in this phase, you will have exactly 20 minutes to acquire new cards, build a collection to show off you awesomeness and put together a tournament deck to play in the next phase. This phase will be split up into 3 sections – of 7 minutes, 7 minutes and 6 minutes. (Though, because it’s easier – we often just set a single recurring timer and just make it 7 min x 3). In this phase, you use the deckbuilding side of your personal board. 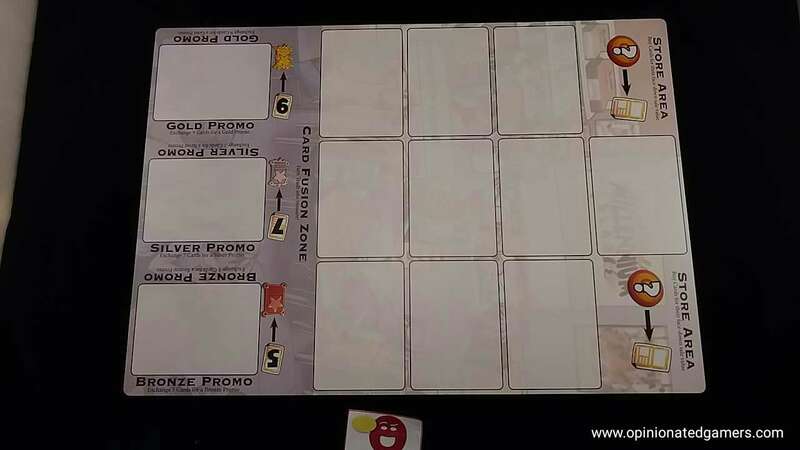 There is an area in the upper left for you to build your Collection – this is a set of cards that you will turn in at the end of the phase for victory points. There is also an area for you to store cards for your tournament deck – which will get played in the next phase. You are generally limited to 8 singles, 1 deck box and 2 accessories in this area. Finally, the upper right has space for your binder, which is just an easy term for “every other card that you own”. The bottom half of this player board gives you player aid information which comes in handy in this phase given the real-time nature. OK, so prior to starting the clock, you have to set up the Deckbuilding phase. 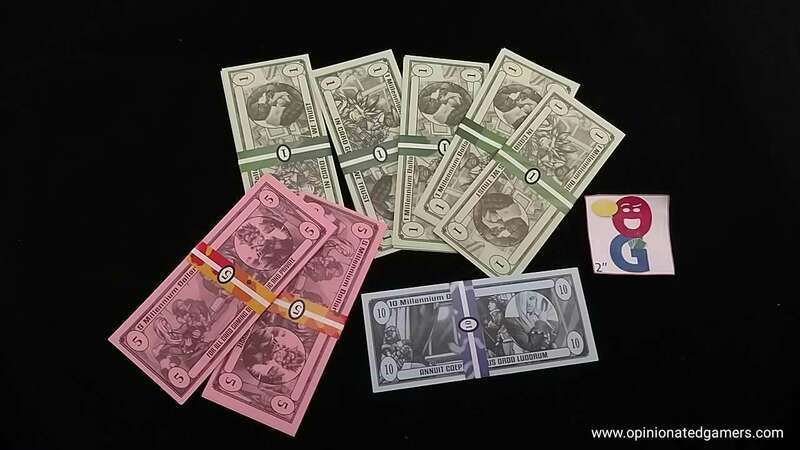 Each player gets 30 Millennium Dollars of income from the bank. Each player is also dealt six cards from the top of the Store deck. They are kept face down and cannot be looked at until the timer is started. The top 9 cards of the Store are then placed face down on the nine spaces of the store. The top card of the Element meta-game deck is flipped over – the element shown on this card will give you a bonus if you have at least one card with this element face up at the end of the next Tournament phase. Then, it’s time to start the first 7 minute timer. 2) Build your deck – at the end of the entire 20-minute Deckbuilding phase, you take the deck found within your Deck area into the next Tournament. Again, this deck can generally be made up of 8 singles, one deck box, and two accessories. You may generally never have duplicates of a single card in your deck. 3) Build your collection – at the end of the round, you’ll turn in a set of cards showing off the awesomeness of your collection. Your collection has to be made up of cards that either all have the same Element or all have the same Type. In addition, each card in the Collection must have a different star value (again, these range from 1-10). At the end of the round, the cards in your Collection will be removed from the game – so you won’t get to use them anymore. However, the VP reward is significant – you will score 0/2/4/7/9/12/16/21 for a collection of 1/2/3/4/5/6/7/8 cards. 4) Buy a card pack from the store – Again, you can see the backs of the nine cards on offer in the store. The art tells you which expansion the card is from, and for non-core cards, you can use the two columns of icons to help guide you towards particular cards with Types or Elements that you want. This could be important as you try to build your collection, or you make have other singles or Deck Boxes that work well with a specific Element/Type. The cost for each card is seen on the upper right corner on the back of the card. Take the card from the store, pay the cost, and then turn it over and see what you got (just like ripping into a booster pack!). Then, replenish the store by taking the top card from the deck and placing it into the now empty space of the Store. 5) Sell a card to the Aftermarket – you might have a card that you just don’t think that you can use… Or maybe you’re just short on money, and you need to get more bucks to buy cards that you want more – in either case, you can always take a card from your area and place it face UP on the Aftermarket. Cover the art with one of your Sell Tokens. As soon as you put the card in the Aftermarket, you take a number of dollars from the bank equal to the star value of the card you sold. If you have no Sell tokens left in your supply, then you can’t sell any more cards. 6) Buy a card from the Aftermarket – One man’s trash is another man’s treasure. If you see a card you like in the Aftermarket, you can buy it by paying a number of dollars equal to its star value. Return the Sell Token to the player who sold the card (and who can now use the Sell token again). You are not allowed to buy a card that you sold yourself! 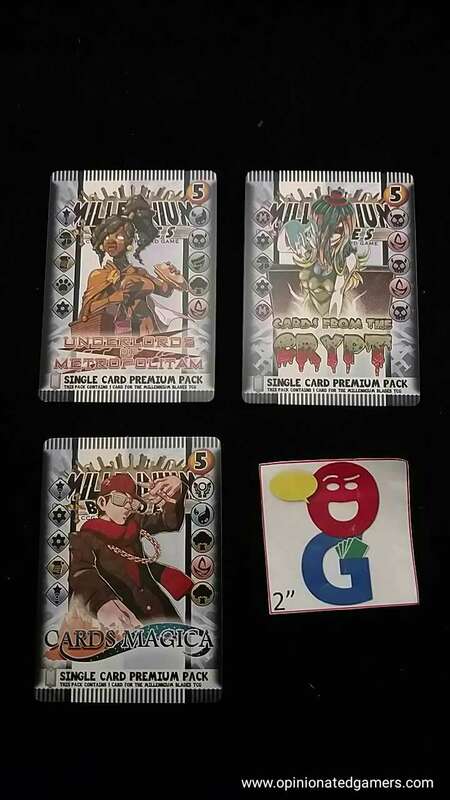 7) Fuse cards to gain a promo – Promo cards are hard to come by, and they often have great powers. In this game, you can fuse cards to gain these high powered promos. You can take 5/7/9 cards from your area and discard them from the game to get a bronze/silver/gold promo from the decks at the bottom of the Store board. Each time you fuse, you discard one of your Sell Tokens for the rest of this particular Deckbuilding phase. In addition, you can only fuse each type of promo once per Deckbuilding phase. 8) Trade with other players – you can always trade directly with another player and hope that you can mutually improve each other’s situation. There is one big restriction to trading – namely, the star value of the trade must be equal. If the cards involved in the trade are not equal, money can be used to equal out the trade (1 buck per star). The other thing that can be offered is a Friendship card. There is a limit that only a single Friendship card can be transferred in a trade (i.e. both players can not gain one). The Friendship cards are worth 1, 2 or 3 VPs and score at the end of the game. These cards do not come into the fairness equation of star values, but there might be a time when the relative value of the cards is lopsided and a VP bribe is needed to make the trade happen. Again, these actions happen in real-time, and it is a frantic period with players trying to do everything at once. When the first 7 minute timer is up, each player is dealt six new cards facedown from the Store deck, and the other Meta-deck top card is revealed – this now tells you what Type of card will score a bonus at the end of the next Tournament. The second section is timed for seven minutes. It is exactly the same as the first. The one thing to note is that you will not be able to sell to the Aftermarket in the final 6-minute sub-phase, so make sure you get any of those unwanted cards into the Aftermarket for money! For the third and final sub-phase, you do not get any free cards from the Store. You can do any of the actions except that you cannot sell to the Aftermarket. At the end of this final 6-minutes, all players should have their cards organized into three areas: the Collection to be turned in for VPs, the Deck to move into the Tournament, and the Binder of everything else. When the Phase is over, each player announces the size of their collection and the VPs scored from it; someone notes this on the scorepad, and all those cards are thrown into the box – they are out of this particular game forever. The cards left face down in the Store area and face up in the Aftermarket area are all placed in the Discard pile. Sell tokens are returned to their owners. The only thing that should be left face up on the main boards are the two Meta-game cards which tell you what Type and Element will pay off bonuses at the end of the Tournament phase. Tournament Phase – now, each player flips over their personal board and takes their Deck in hand. It should be checked that none of the numerical limits for the Deck are exceeded. If they are, players should discard randomly until they have met the limits. 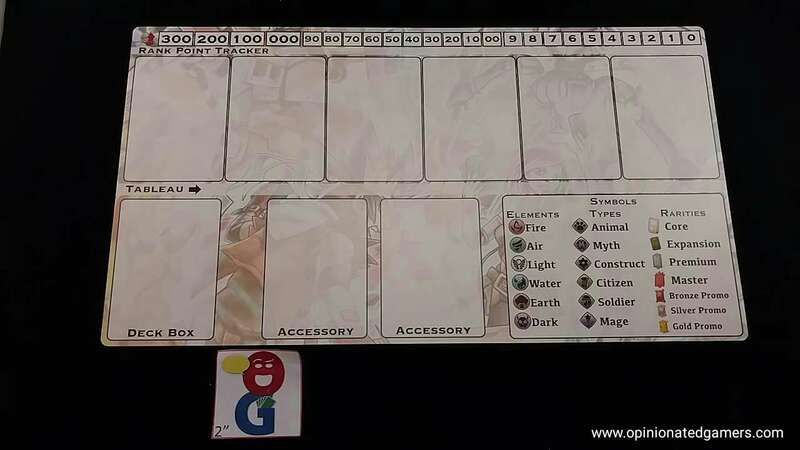 Each player can set their Deck Box and their Accessories on the allotted spaces near the bottom of the player board. The Deck Box generally is a card which offers large scoring bonuses. The Accessories have varying abilities, and can be used in a number of different ways. Players also should set their Ranking Point (RP) score to zero. There is a little track at the top of the Tournament board which can be used for this – though in our group, we have moved to using dice to track the RP score. The goal of the Tournament phase is to have the most RP – that is, to be the player with the best showing in the tournament. You will score more VPs for doing better in each tournament, and you the rewards grow as you get into the later tournaments. For instance, you will score 21 VPs for winning the first tournament, but you will get 18 VPs for coming in fourth place in the final tournament! So, in the Tournament, you get a chance to show off your deck. There are six slots on the Tournament board for cards, and on each round, you’ll get a chance to optionally take an Action and you must play a Card to the board (though you can do this in any order). Note that you have 8 cards in your Deck allowance, but you’ll only play 6 cards. These extra cards will give you a chance to possibly switch up your strategy mid round if the situation calls for it. It will take some careful planning to give you the flexibility that you need with the limited hand size. When you play a card, you place it in the left most open slot of the card row, and then you read and resolve what’s printed on the card. If there is a “Play:” element on the card, that thing happens as you are playing the card to the table. If there is an “Ongoing:” effect, it starts happening as soon as the card is played and remains in effect as long as the card is face up and can be read. “Flip:” effects happen as that particular card is flipped over – this flipping might be triggered by yourself or by an opponent. Flipped over cards still count as a card, but they essentially have no other characteristics or effects. “Score:” effects on the card will score you RPs at the end of the tournament based on their text; but they must be face up in order to score. “Top:” effects happen as long as that card is your top card – that is, as long as that card is the right most face up card in your row. “Next:” effects will strangely enough affect the next card played in your row. Anyways, read the card and do what it says. (There are a number of other special abilities that are specific to certain expansions – just make a point of explaining those abilities at the start of the game when you are setting things up). When you choose to take an Action – you are using the “Action:” text from a previous played card, your deck box, your accessory or possibly your player’s unique phase ability. When you take an action, you flip over the card on which the Action was printed on. You are limited to only being able to take one Action per turn. If the effects of a card or your action tell you to gain RP, you mark this on the RP scoring chart. Thus, in the course of the Tournament, you get a running total of RP collected so far, but keep in mind that most decks will score the majority of their points only at the end. There are rare cases when you will not be able to play a card – when this happens, you must pass your entire turn; you do not get to take an Action when you cannot play a card. This happens when your card row is already full OR if your hand is somehow depleted of cards (perhaps you didn’t put enough cards in your deck in the Deckbuilding phase or maybe an effect has caused you to discard cards from your hand). There are instances when the game will instruct you to clash with another player. When this happens, each player compares the total star value of their Top card added to a randomly drawn card from the top of the Store deck. The drawn card is then placed in the Aftermarket. Once each player has had a chance to play six cards, the Tournament ends, and it now moves into the Scoring phase. Each player starts with the RP count that they have accumulated through the playing of cards. Then, each player calculates the RP gained from any face up “Score:” text on his cards. He then scores his face up Deck Box and Accessories. Next, he looks at his player card to see if it offers any unique RP bonuses. Finally check to see if you have face up cards with the Element and Type denoted on the Meta-game bonus cards on the Store deck. When this is done, announce your RP total and compare scores, and then award VPs based on your relative rank of RP. After the first and second tournaments, each player is given a random Bronze/Silver promo card as their award for participating in the tournament. If there is still more to play, then reset for the next deckbuilding phase. All of the cards used in this Tournament are returned to your binder. If you liked the way your deck worked, you can leave it alone or look for a few cards to specifically tweak it. If you didn’t like it, maybe it’s time to start over and build a new deck. If this is the third tournament, then you move to final Scoring. 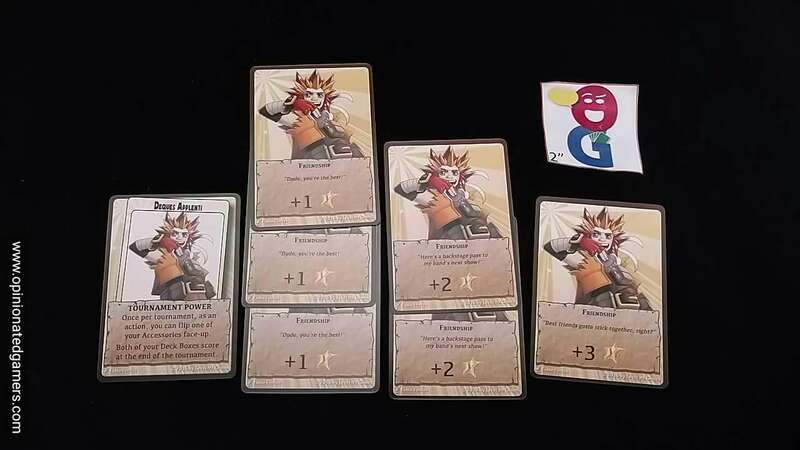 There are only two things that score at the end of the game: you get 1 VP per 4 Millennium Dollars left over, and you score VPs for the Friendship cards that you were able to acquire from your trades (limited to 6VP from each opponent). The player with the most points wins. If there is a tie, the player with the most VPs from tournament results is the winner. So, that’s pretty much how it works. The only other important rule that doesn’t really fit in anywhere else is the prohibition on “takebacks”. The rules specifically say that you shouldn’t be allowed to take things back. If you forget to include a card in your Collection or Tournament Deck – well, tough noogies. The deck-building part of the game is meant to be time-pressured, and figuring everything out in the time limit is part of the game. Also, once in the Tournament phase, you can’t take back a card play once your turn is over – it’s nearly impossible to know what other players have in their own Decks, and once play has moved past your turn, there are no takebacks. If you forgot to take your optional Action or thought that you played the wrong card there – hey, just do better next time. The other bit that I should talk about here is that (like every other CCG), if there are rules conflicts between the base rules and the special rules on a card – the rules printed on the card take precedence. 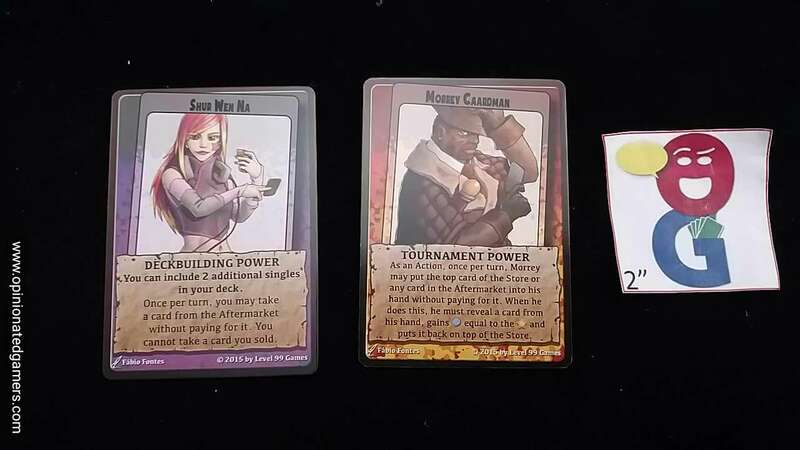 The special abilities of the different characters all generally break the regular restrictions of the rules, and there are many cards in the game that beneficially alter how the rules apply to you or opponents. Actually, the game has 5 OG writers on cards! But, the plan was to have a gaming weekend to celebrate my brother’s 40th birthday. Each of the four of us was tasked with bringing a game that was perhaps too long for your regular group, but great for an extended weekend of gaming. The weekend proved to be an eye-opening weekend in that I found a number of games that I really enjoyed which I had not been exposed to before. Mechs vs Minions was one of those games, and Millennium Blades was the other. We played the game once that weekend – starting with a trial tournament to learn that aspect of the game and then resetting to play the full three tournament game, and I was immediately in love with it. Ever since that weekend, I’ve been trying to get this game to the table at every opportunity, and I’ll admit that this hasn’t been the easiest task for me as the game often runs north of 3 hours of time once you include the setup and cleanup – just imagine that it takes awhile to separate the cards in play into the 20+ types! The game really does bring the excitement, challenge, skill and luck that was a part of my old Magic: the Gathering playing days. The deckbuilding phase is the meat of the game for me, and trying to get everything done in the limited time window is invigorating. You end up with at least 20 new cards in each deckbuilding phase (2 sets of six cards for free plus any others that you buy from the store), and you really have to quickly figure out how those new cards will work with your others. I usually just spread all my cards out in front of me. I don’t really care that the other players can see what I’ve got because, honestly, they should be concentrating on their own mass of cards and not wasting time seeing what I’ve got on the table. Building the collection is usually the first order of action for me, but working on the deck is something that has to be percolating the whole time. If I can, I’ll usually try to be working on two ideas at once, and then try to figure out which is the best in the final section of the phase. I like to start each deck with a Deck Box and then build around that. The RP bonus for some of the Deck Boxes can often exceed 40 RPs, and that can be 20-30% of the overall RP score of your deck. Many of the Deck Boxes look for a specific type/element/action on a card, and you can use this to focus in what cards to look for. I’ll often spend all my money early on just trying to get a bunch of new cards and then take some time to read them and figure out what I’ve got. If I want to go hunting for more cards later, I can always try to trade for them or sell some high-star valued cards in the Aftermarket to provide me with capital for later purchases. If possible, I might get a promo card or two with some low value unneeded cards, but this often is a complete crapshoot. While the promo cards often have great effect, they are also very finicky and hard to incorporate into a deck. Once we’re in the final 6 minute section, I am pretty much refining my deck for the Tournament. I like to have my six cards lined up in order that I want to play them, and then I try to find a few backup cards that will still help me score RP if the main action of my deck is nerfed somehow. If there’s time, I might look at other people’s collections and see if I can make a trade to benefit both of us (because we’ll each gain on the other opponents) or I might even start working on my collection for the next round. As you have to permanently discard your Collection each turn, it’s always good to keep an eye on the next round to try to save a minute or two there. And while I like the action of the Deckbuilding phase best, the Tournament still offers a lot of clever play in the short six-card cycle. Many of the expansions target opponents, and it’s a tough puzzle to try to get your deck to do what you want and withstand the attacks of your opponents. In every game so far, I’ve seen at least one ‘a-ha’ awesome combination that someone was able to discover, and I love that aspect of the card play. Though I haven’t found one yet, the game even has rules to accommodate infinite loops – so I’ll keep looking for them as we play. Components – overall, the components are decent and sturdy. The cards have held up to the shuffling quite well so far, though of course, you don’t really shuffle these as much as regular CCG cards. The majority of the shuffling occurs at the start of the game when you take all the different mini-decks and mix them together into a single Store deck. The artwork on the cards is well-done, and I’ll admit that it is quite humorous and thematic at times. There are plenty of puns/pop culture references in the different expansions. Guess what the following expansion sets are based on: 006 Plus one, Super Plumber Bros, Lightning Bug? The actions/art/characters in those expansions very much mimic/play on the worlds of James Bond, Super Mario Bros and Firefly. However, there are a few things which I’ve changed or added to the game to make it play better (at least in my opinion). The most important one is to replace the RP scoring track found at the top of the card row on the player board with dice. We now use some extra d8, d00 and d10 dice to keep track. The problem with the scoring track is that the little wooden cubes used to track the score were so easily jostled with card plays and card flipping and whatnot. 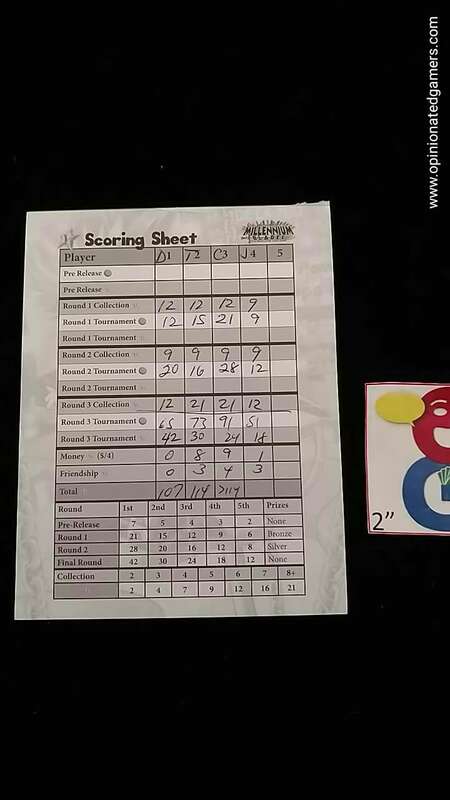 In our first few games, it was not uncommon to look over at someone’s board and realize that the score cubes were in disarray – and of course, it was hard to remember what the score should have been. Using larger polyhedral dice has helped keep track of the score easier. The other thing that I wish has been included in the box is a set of Randomizers. Part of the fun of the game is seeing the varied setup at start of each game. Each expansion set has a particular theme – of both flavor text and actual card action. The way that certain sets interact with others is quite individualized, and I like to randomly select the card sets in each game so that there are no pre-set strategies. Unfortunately, no such randomizer cards were included in the box. I have fixed that with a color copier and some card sleeves (one of the perks of developing Dominion is that I have all sorts of accessories and supplies lying around) – they now reside in an old Ultra-Pro deck box which stores them all and the deck box serves double duty as our location for the trashed cards. Oh, and let me talk about the wads of money. Yes, actual wads of money. It took me approximately the first three quarters of the 2017 Orange Bowl to count out stacks of 5 paper bills and wrap a sticker around the bundle. It definitely has a cool, wow factor when you see them for the first time, because it’s really an audacious thing to include in the game. Sure, when I was buying Magic cards, it felt like I was spending wads of money, but in reality, they’re really hard to deal with, they don’t stack well, etc. When we play the game at my house, we replace the wads of money with manageable numbered poker chips. It is tidier, and easier to handle the money. There’s enough things on the table as it is without it being littered with hundreds of wads of money too. I will note that the rules include special rules for two-player games as well as a turn-based (non-real-time) game, but we have not tried either. First, I love the game as written, and second, all the other reviews on the Interwebs suggest that these two modes are really not fun at all. I haven’t found any reason to try to prove them wrong. While I have stuck to the “basic” rules, there are a number of other variants/extensions that will add to the excitement and complexity of the game. The one which I would like to try first is Liquidation Mode – in this mode, you must discard your entire Tournament deck from the game after each Tournament. Thus, players who have a successful deck in the first round cannot ride this to easy victory in successive rounds. You must re-build your deck from scratch in each deckbuilding round. As the frenetic Deckbuilding phase is what makes the game work for me – I think that I would love any set up which adds to the excitement of this phase. 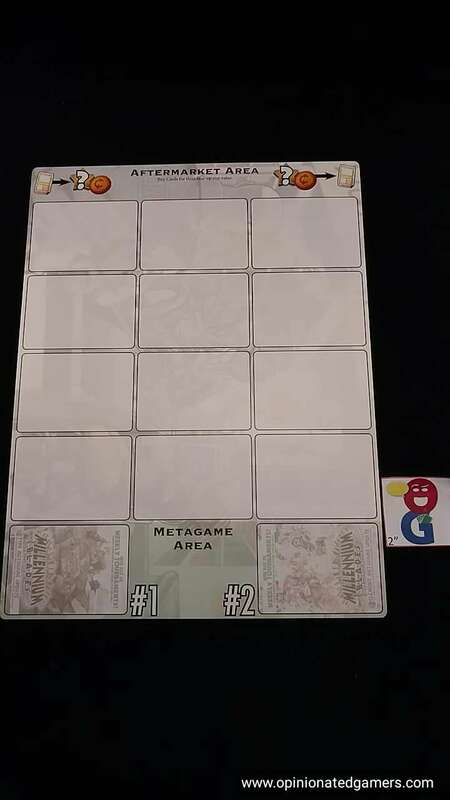 The other optional addition that might be worth trying is the Venue deck – which is a series of cards that gives you a random location for each of the tournaments – and, of course, special rules that go with each location. The venue is revealed at the start of each Deckbuilding phase to give all players enough time to figure out how to deal with the rules of engagement for the next Tournament. Thus far, Millennium Blades has been one of the three longer games to captivate my attention since Christmas (the Colonists and Aeon’s End being the others). Lucky for me, we’re heading into the “gaming doldrums” – that period of time from the New Year until about April when there aren’t a lot of new releases coming out. That should give me ample opportunity to get them to the table a bit more until the new competition arrives! Nathan Beeler: Millennium Blades is an impressive design with a brilliant meta-infused idea for a theme that pulled me in straight away. The amount of work that must have gone into tuning the cards alone is staggering to ponder, nevermind all the flavor text and artwork involved. I applaud the designer and publisher for those things, along with many other ballsy things they tried to do. The sheer amount of possibilities for play involved in the base game alone should grab any gamer’s imagination, at least a little, and I was no exception. I went in primed. Giddy even. Then we started. The game pretty quickly killed all the excitement it built in me, as the mountain of different cards and abilities really just meant a mountain of chaos in the gameplay. The longer the game went on (and it went on and on and on) the less fun that aspect became. A lot of time and effort went into finding cards to fit into a collection, working out fair trade deals, quickly determining which cards were useful and which ones I could sell or convert into other cards, managing the order of card play during the tournament to keep critical cards from flipping, and trying to maximize my score, only to have it all washed away by some ludicrous card I’d never seen that undid all the work I’d put in. I’m fine rolling with the punches like that in a twenty minute affair, but I really don’t want to play a three hour gamer version of Munchkin. Speaking of Munchkin, the theme of Millennium Blades will no doubt be a great draw for some like Dale who have experience with that world. As previously noted, I liked the idea in concept. But in practice it felt like insider baseball. Other than rarely dabbling with Magic, I am not a CCG player. I know about different card rarities as a concept, but I’ve never played a tournament, been to a pre-release event, built a deck, or kept a single card in a binder. The jokes either passed over my head or quickly fell flat, and what I was left with were game mechanisms that were either too quick and chaotic or too long and chaotic. The game didn’t work for me or three of the other four people I played with. I know it has and will have fans, but we left it disappointed. And yet, some part of me holds out hope for the game. Maybe it’s better with fewer players. Maybe once I know what to look for, the mad scramble of the deckbuilding phase can actually be fun. Maybe the tournament phase could get to a point where it recognize that someone made a clever play instead of “oh, well that’s now happening”. I doubt I’ll ever know, because there are too many games in the world to keep trying really long ones that don’t grab me. But with Millennium Blades there’s almost just enough there to think it’s possible. Maybe. Jonathan F.: This is a piece of art that is both exciting and ultimately made me feel like Sisyphus, the guys who always pushes the rock up the hill and it always ends up at the bottom for him to push up again and again and again. First, the incredible game design. It is a crazy amount of work to create a game like this. Brad and Level 99 have an amazing ability to create these complex nested card effects that create fireworks in new and different ways with each interaction. Kudos. The game is exciting because it is time-pressured deck building and also a highly-interactive mini-game (the tournament) with lots of highs and lows. Millennium Blades is not for me because don’t seek stress in gaming, I seek to avoid stress. If you are not a Galaxy Trucker fan, for example, this game hits some of the same spots, so that might be a litmus test. I like Space Alert because it is short. This one is not short, so you are making a commitment when you start a game of MB. I don’t get joy from seeing combos hurt other people or cost them the plan they were creating. MB, and I assume most CCGs by extension, are just that. It is fine if I incidentally throw them off a bit, but the goal here is to prevent others from scoring points as much as it is to score points yourself. Pressure, chaos, and negative interactions all lead me to admire the game without wanting to play it again. I am not writing off MB for two reasons. First, it is a great idea and if Brad and Level 99 came up with MIllennium Meeple where the tournament is a type of game I liked, I would be all in to have the metagame be game design using various mechanisms, themes, format, length, player number, etc. that all meet the judges’ desires. Sort of like a ‘wine fair’ :) Finally, there is something that might get me back to MB itself. There is an expansion coming called Set Rotation. I am curious how it will change the game to become a co-op. The revised game might be all the coolness of the idea without the combat/negativity of the tournament game. Craig V (2 plays): I have actively avoided getting into any collectible or living card game due to the financial and time requirements. Typically, those types of games cost a lot of money to acquire all of the necessary cards as well as require a lot of time hunt down those cards, build decks to play, and learn about the various strategies. While those types of games are definitely interesting, I just can’t commit the necessary resources. 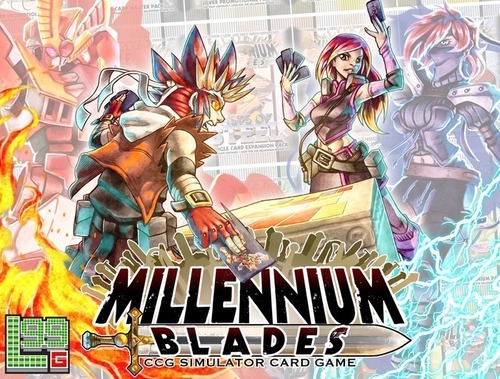 However, imagine if it was possible to distill the entire CCG experience into a single game that doesn’t require any more than what’s already in the box… Well, that’s exactly what Millennium Blades provides and it does so in a BIG way. There are a TON of cards in the box to the point that I have played twice now with different sets of cards and still haven’t even used all of the cards. I can’t fathom the amount of time and effort that must have gone into the creation of this game! I was most apprehensive about the real time acquisition/trade/build portion of the game, but it works surprisingly well and adequate time is provided to get the job done. The tournament portion of the game is pretty fun as well, but it can drag a bit as players try to optimize their turns. I have had fun playing this game, but a full game with four players takes several hours to play which is a bit more time that I’d usually like to commit to a game. Frustration can also become an issue since each round builds on the previous and while there is an opportunity to improve your deck and strategy for the next round, it may already be too late catch the leader who probably already has a superior deck and is tuning it further with each round as well. There is a gameplay variant in which the tournament decks are trashed each round, but I haven’t yet tried it to see if it improves the gameplay dynamic in a favorable way. Overall, there is a lot happening at once during this game and it is very tactical. Millennium Blades is an immersive experience and a unique game that I will probably never be good at playing! Not for me…Nathan Beeler, Jonathan F.
Glad to see this review! First of all, I love this game… a lot. But I will admit it’s not for everyone, and I was happy to see a wide spectrum of opinions at the bottom. I haven’t been into board games long enough to make this assumption about them, but as far as movies and video games go (maybe even television shows) there has been a trend to create overly polished products. I once heard the metaphor (in reference to video games) that some indie develops didn’t like that video games were so polished down that they were smooth, without detail or jagged edges. Those “quirks,” as the developer who made the statement put it, made their game stand out, and ensured that their target audience would absolutely go crazy for game. They didn’t care about the whole population. Wow. That was a longer digression than I expected. All of that was for me to say that I think Millennium Blades is one of those games. Is it the best game ever made? Not for everyone, not at all. But for some people (and I would put myself in this category) it is one of the best damn times I have had with paper and cardboard. I agree that this game isn’t for everyone, but as you can tell, I would also agree that it’s one of the best games I’ve played in recent memory. My own experiences echo the ratings seen here – for every person that I’ve tried MB with who loved it, there have been at least as many that have wanted nothing to do with it ever again. I think it directly correlates to the amount of time that they played M:tG or other CCGs in their youth. Yeah. And I’d argue that it goes one step further and really caters to those who not only played CCG’s in their youth but the Saturday Morning Cartoon crowd (ie the Yugioh anime).